Blue “Tiger Eye” gemstone beads have the “Thin Blue Line” within them. Non-plated brass Catholic medals and findings compliment the artisan design style of this rosary. This one decade rosary is strong and durable – made specifically for an officer and is handcrafted to last. It would also make a nice addition to a squad car… Make sure you have it blessed by a priest. 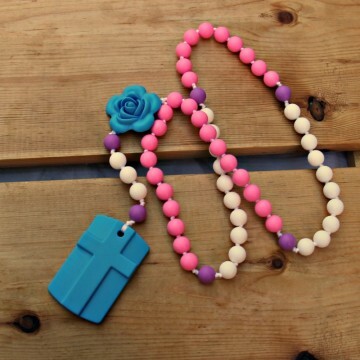 Quality Rosaries for Praying and Displaying! 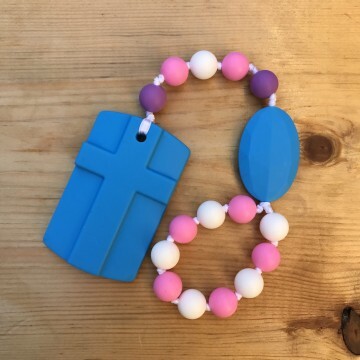 Garden Path Rosaries™ carefully chooses every component to aid you in your prayer and meditation as if walking along a garden path deeply imbued with thoughts of the Triune God, His Angels and His Saints. I began creating artisan rosaries and chaplets as a source of enhancing prayer beyond the rosary itself. Fulfilling those needs, the rosary became also a remembrance of the spiritual journey and specifically the present relationship and calling with Christ, His work, Our Lady, the Saints and their significance in my daily life. After having beads that gave personal meaning to my prayer life, I found myself going deeper into meditation with the very symbols the beads represented. In short, “looking at the beads” became a source of contemplation for me. I felt like others could benefit too, so I began creating rosaries inspired by my own prayer designs. I hope you enjoy praying them as much as I do! HOW ARE MY ROSARIES AND CHAPLETS MADE? The metal parts are solid untreated raw brass. They are a type of yellow brass known as “red brass” because of their high copper to zinc ratio. Sometimes they are referred to as Nu-Gold, Low Brass or Merlin’s Gold. They are highly polished to a bright brilliance with modern techniques and machinery. These brass rosary parts look just like 14 karat gold. Gold prices have risen extensively over the years. This is a way to get the gold look without the expense. 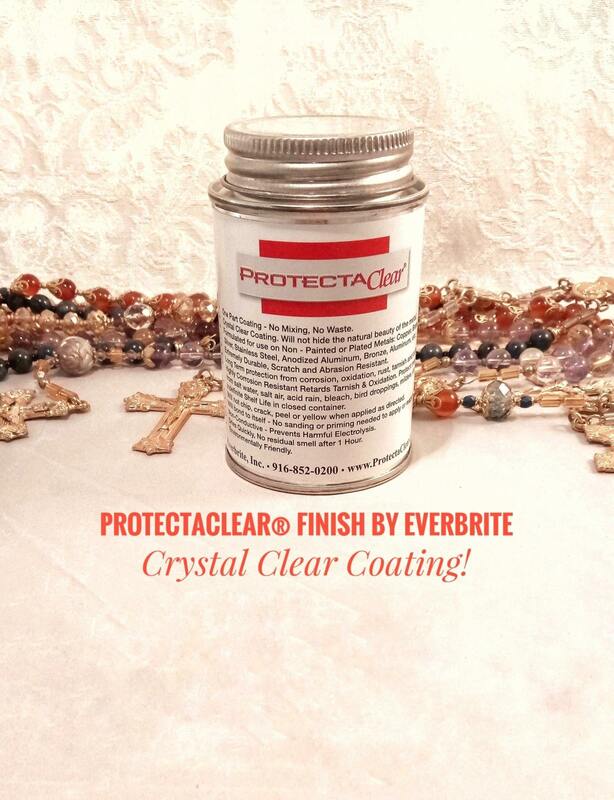 Each crucifix and rosary center are hand finished with Protectaclear® for lasting durability. 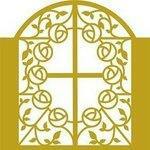 About My Artisan Design Style: The handmade rosary and chaplet designs of this shop are contemplative in nature. Because these pieces are works of art, they can also be displayed in the home as a visual source for meditation. About the Construction of these Rosaries and Chaplets: I only use the strongest 49 strand cable wire marketed as professional beading wire. 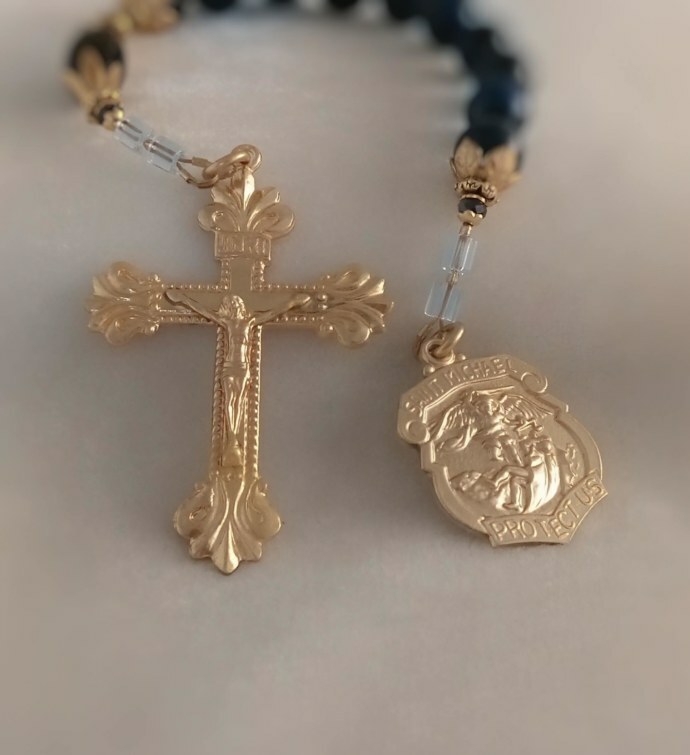 I also use raw brass wire guardians at my connections to further protect from friction and eliminate any fraying on the cable wire where it joins to the crucifix and rosary center. I double use solid raw brass crimps that are very soft and do not harm or cause stress on the wire. My solid brass jump rings are hand made in the US and are cut in such a way that they “click and join” when brushed together at closing. I temper these jump rings after closing which actually further strengthens and hardens them. I use these for free movement as they take away the stress of movement that otherwise would be channeled to the crimps. I refuse to make a rosary that cannot be used for pray or devotion. 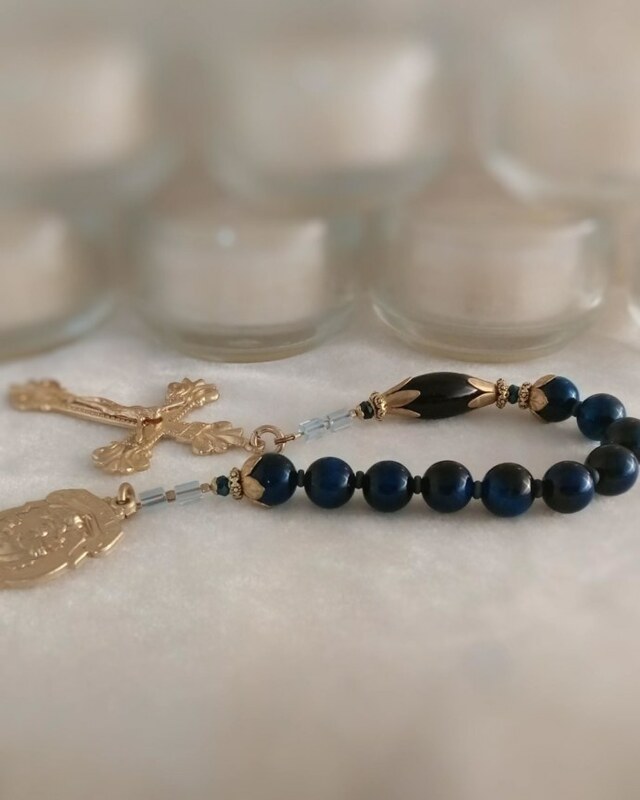 About the Heirloom Quality: I do not use any base metal plated parts nor silver, bronze or gold tone finishes anywhere on my heirloom rosaries. There are no finishes to be worn off from daily use on bead caps, crimps, spacers etc. The metal parts are all brass. 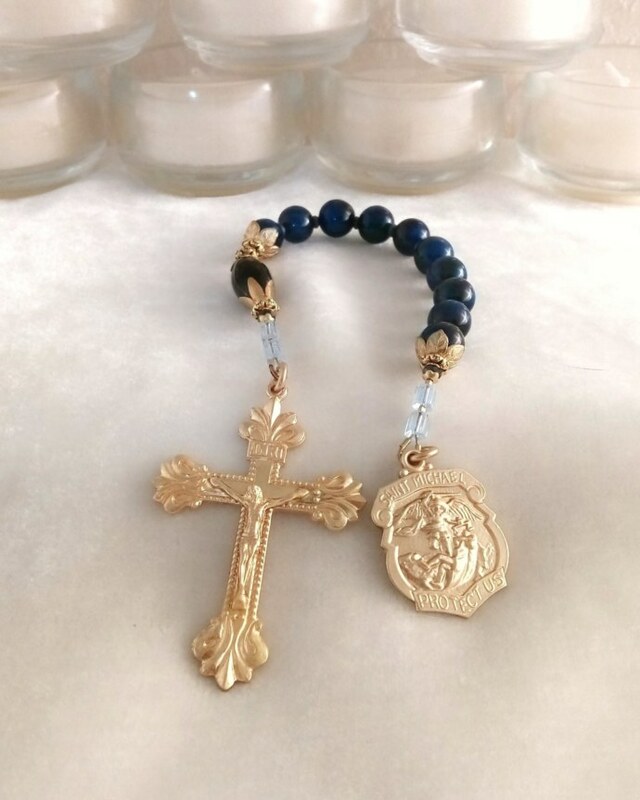 The beads used for these rosaries are ALWAYS high end and are usually made from a high grade gemstone, expensive art glass, Swarovski® crystal or genuine vintage finds. C – Opaque with rough spots, fissures, inconsistent color patterns; noticeable nonuniform sizing – usually not suited for rosary making, must be carefully inspected. Protectaclear® finish just needs to be wiped with a damp cloth as these pieces are lacquered. For “antique jeweler’s brass” and “hand cast bronze,” I recommend mild soap and water as well. This shop, its name as stated i.e. Garden Path Rosaries™ or Garden Path Rosaries and Chaplet Designs™ as well as its its online expressed combined title: GardenPathRosaries™ all of the intellectual property created by this entity and owner, and its ideas artistically expressed, are trademarked and copyrighted under US Copyright and Trademark Laws. All rights reserved whether expressed or otherwise. 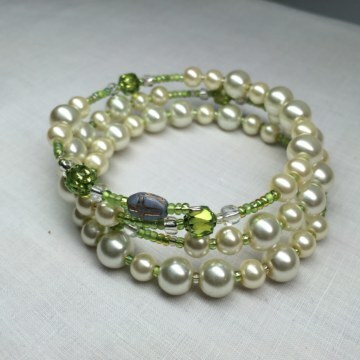 All items are shipped insured with tracking either USPS First Class or Priority Mail. 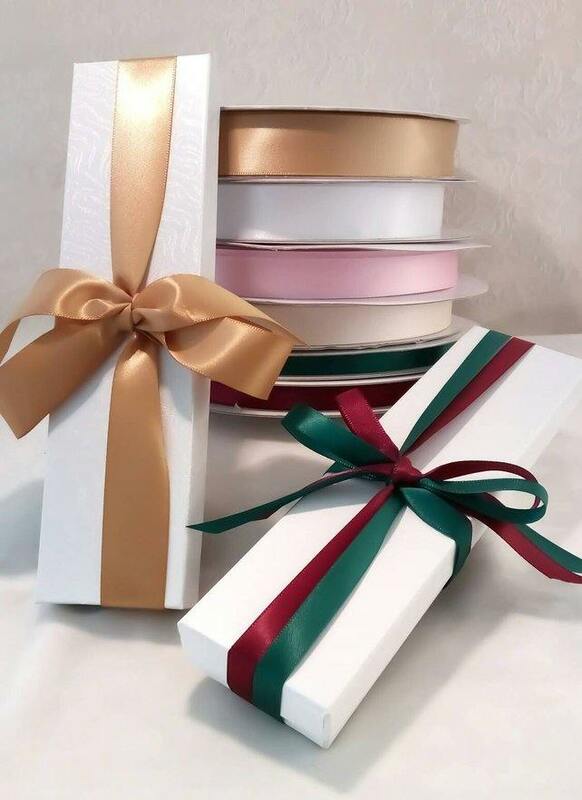 All rosaries and chaplets are shipped in an individual gift box to protect them during shipment. International orders can also be shipped USPS First Class International or Priority Mail International with tracking and insurance included. For International orders, Garden Path Rosaries™ will not be responsible for damages, losses and or additional charges incurred while in transit including but not limited to: International customs charges, tariffs, VAT (value added tax), postal pick-up charges etc. or be responsible for shipments once they leave the US. The US post office mainly tracks and insures items in the continental US. If you need assistance with an international order you can contact me via the shop mail button above. Garden Path Rosaries™ takes great care and time designing and creating rosaries and chaplets of the highest quality materials. 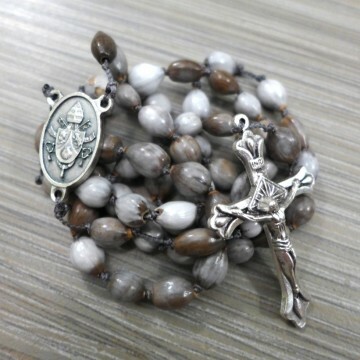 Because these are one of a kind handmade artisan rosaries and chaplets, no returns, exchanges or refunds will be given. Your order is shipped insured with tracking to cover the transit. Feel free to contact me if something arises that needs immediate attention. I will gladly assist you in any way I can. I look forward to serving you!